Rabindranath Tagore creates a mood, and then in his characteristic way, takes us slowly through the song's subtle message. 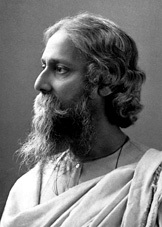 A poor, incomplete translation does not do justice to its melody and nuance; I also believe translated songs are truly inadequate to understand and cherish the ocean-deep Tagore treasures largely unknown to the world outside Bengal or India. Cheers to us -- the cheerleaders. Homage to the poet of all poets on his 150th birth anniversary.